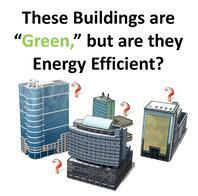 LEED-Certified Buildings: Energy Efficient or Not? There has been some heated discussion lately about how much energy LEED® certified buildings use. When the US Green Building Council (USGBC) first came out with its Version 1 LEED Guideline in 2000, a building could earn LEED certification without any points in the energy section. In the early 2000s, making a building more energy efficient than the building codes was more of a challenge for architects and engineers than it is today. When applying for certification, they would attempt the “easier” and often less expensive points available under other credits. This does not mean that the buildings were not built sustainably, as many architects and engineers design in that manner as a matter of course - and have been doing so for decades. It does mean, however, that many of those buildings, while having been built with sustainable principles, were not necessarily more energy efficient than similar buildings. In its early days LEED certification focused on material sourcing, such as using low VOC (volatile organic compounds) and regional materials, as well as design elements like how much daylight could enter the building. Soon after LEED began gaining traction, some organizations, including ASHRAE, challenged the USGBC - how could they call a building sustainable when it wasn’t using less energy than similar buildings? UCGBC answered. In June, 2007, they instituted an energy prerequisite, or prereq, so that a building had to surpass ASHRAE Energy Standard 90.1-2004 by a minimum of 10%. A prereq is something that has to be done but does not receive points. Standards, such as ASHRAE Energy and Ventilation Standards and other building codes, are minimum requirements. If you build to the “standard,” you will get a minimum building, or a minimally functioning (efficient) building. LEED was designed as a “guideline,” not a Standard, to encourage architects, engineers and builders to strive for better than minimum. By the time the prereq was added, many buildings were already registered with USGBC under the original guidelines. Those buildings did not need to satisfy the prereq to apply for LEED certification. They still were built according to sustainable guidelines for new construction - but not necessarily for lower energy use. The lack of energy efficiency in buildings constructed during that time is not USGBC’s fault. The ability and technology were there. The considerable number of LEED points was there. The builders and developers made the business decisions on which points to attempt, and they often chose other points. Was that the best decision? It was for the involved parties at the time. It is no surprise that in the early 2000s many owners and developers opposed LEED because it made buildings more expensive to construct. Since that time the industry has done a much better job of showing the long-term financial value of an energy efficient building. Manufacturers have also developed low VOC products, products with recycled content, and other items that are priced the same as, or only slightly higher than standard products. Even though a LEED-certified building may cost a little more up front to build, and many don’t, over time it will cost much less to operate, and that difference will more than make up for any increase in first cost. More recently, forward-thinking building owners and developers have realized that the cost of constructing a building is a one-time expense, but the cost of utilities is a constant expense that will continually increase. The smart ones are making better choices up front. And the LEED energy prereq didn’t hurt.